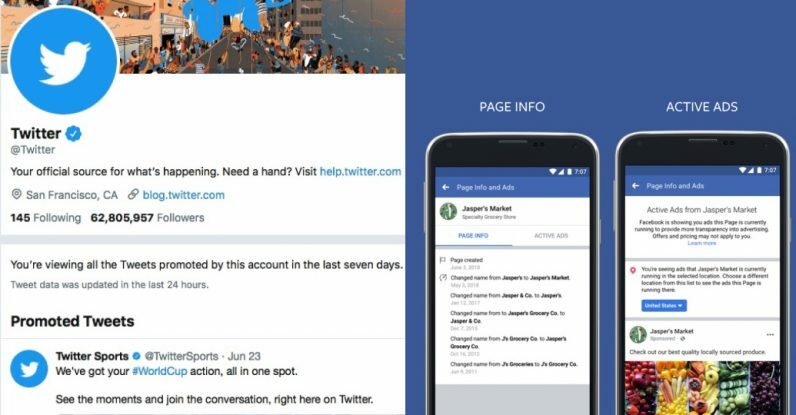 Twitter opened its Ad Transparency Center, which allows anyone to look up a particular Twitter handle to see which ads the account has run in a massive public archive. You don’t need to be logged into Twitter or even have an account in order to use it. For accounts run by US political advertisers, you can find out how much they paid for their ads, as well as their billing addresses. Most surprisingly, you can see the ad details, including which demographics it was targeted towards and which ones it actually reached. As for Facebook, it’s opened a new section on every Facebook page with information on all of the ads the page is running. On the same page, you’ll also be able to see when the page was created, and when, if ever, it’s changed its name. For political ads, it will show who paid for the ad. Considering how much scrutiny the two companies have been under for their mishandling of advertising and fake accounts, it’s no surprise they’ve finally rolled out something counterbalance those criticisms. It’s a good step, although I’d wager it’s not going to be used as much as either company is hoping it will. The biggest roadblock is that, in both cases, the users have to care enough about the integrity of the ads to look up the information in question. I’d suggest Twitter, for example, include a link in every promoted political tweet which links to the Center from the main site, which would cut out the middleman somewhat. Also, you can’t search for ads by term or by content on either site, which means you have to check these things as you see them. As my colleague Bryan pointed out earlier this week, the way the two companies handled ads was so ruinous even unrelated companies, such as Apple are going out of their way to avoid making the same mistakes. In Apple’s case, it’s creating a special section of its News app specifically for the 2018 US midterm elections with curated news from verified sources. To see both companies make strides to get rid of is promising, but I question how many people are actually going to go to the trouble of looking up the ads on separate sites or pages.